The last weekend on June, Isaac raced in the elite AG division at the Dam Tri in Pennsylvania Since there isn’t ever really any useful data in the swim portion of the triathlon other than comparing his time to other competitors (due to variation in course length sometimes being short or long, gps errors, etc. ), we will move right on to the bike data. His VI was 1.07 for the highlighted portion. Anything 1.05 or less indicates a smooth power output. With all the hills in the course, that made it harder to achieve the 1.05 or lower target. Not too far off here either. The graph above is called a Quadrant analysis. 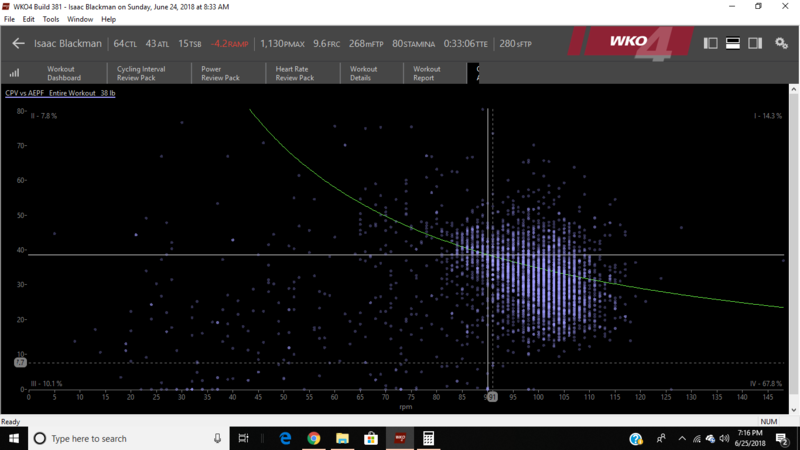 What I want to see when looking at this is the majority of the bike should be in quadrant 4 (high cadence and low force) because that is where a triathlete uses the most fat for energy to produce the wattages. It also means they are pedaling faster which most mimics a normal run cadence making it easier to run off the bike. The next quadrant I want to see the most time spent in is Q3 (low force/low cadence). Time should be limited in quadrants 2 (high force, low cadence) and 1 (high force, high cadence) since that is where glycogen is used more to can really zap energy later in the race (especially the run). Isaac did remarkably well on this! Click here to read more about Quadrant Analysis. I recently bought some new software to help analyze power files and the software engineers created new power zones based on Dr. Coggan’s work called iLevels. Dr. Coggan came up with them to directly correlate with an athlete’s unique power distribution curve. 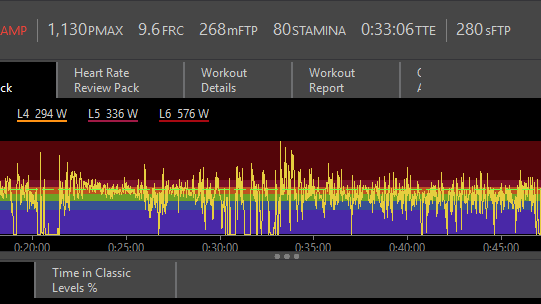 Isaac spent the largest majority of that time in his time FTP/FRC iLevel (similar to the VO2 Max intervals in the classic levels) and FTP iLevel. This comes down to about 36 minutes total time in the FTP and FTP/FRC zones. Next I want to zoom in on what WKO4 calls the Hero Bar. What I want to do in the next few weeks of training is try to get his TTE longer than 33 minutes so you can hold that higher power longer. From what I’ve been learning in the last few days of WKO4 software, I think i can do that. 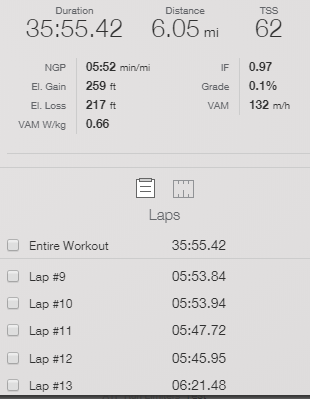 Isaac has a very good FTP, especially for his body weight, we just need to get him to be able to hold that a little longer for his OLY races. 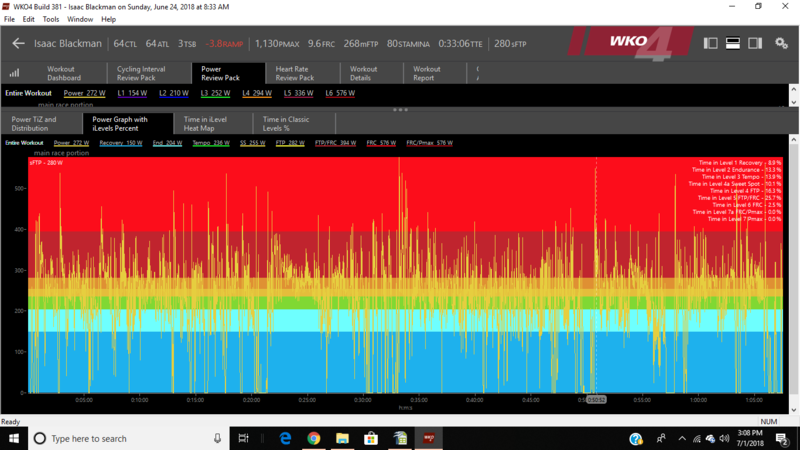 The plan is to longer FTP and sweet spot intervals and some tempo rides that have him riding tempo for 150% to 200% of the time for TTE. From the time I had looked at this data, Isaac had 6 weeks til AG nationals and 2.5 months until AG worlds in Australia. So, both Isaac and myself have some work to do. 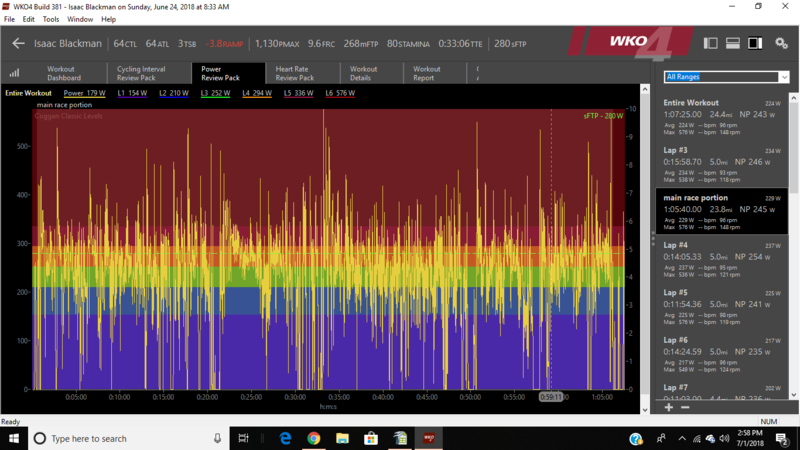 As a coach, I will be prescribing longer FTP, SST, (sweet spot tempo) and Tempo intervals and do a few less FTP/FRC intervals (traditionally VO2 Max intervals) than we have been doing. Time will tell if the work I plan to prescribe pays off for Isaac at USAT AG Nationals and AG World Championship later this year!